Shingle roofs take a lot of abuse, especially in the winter. While some damage is inevitable, some damage can be mitigated through preventative measures. As a homeowner, there is perhaps no time more important to care for your roof than during the winter. 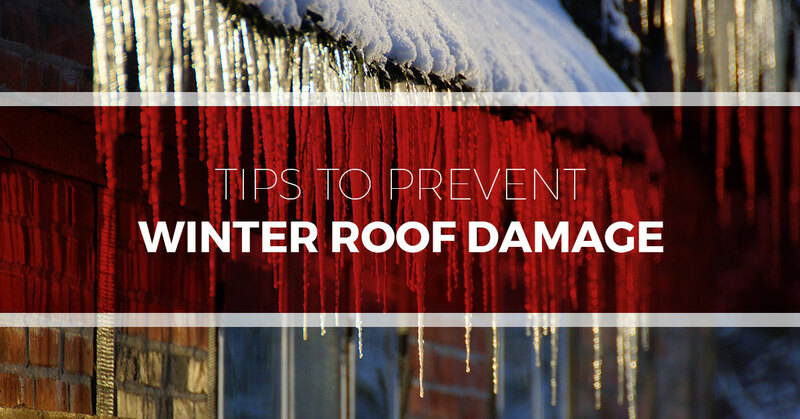 This is primarily because of the threat of ice dams, which can wreak all sorts of costly damage. Before winter arrives, consider applying these tips. Although it may seem like common sense, it’s worth mentioning because of its importance. Regular roof inspections are the surest way to maintain and protect your roof. When performing an inspection, it is not enough to go into your yard, back up to the edge of your property line, and look for any potential signs. While this might help you see big problems (e.g. missing shingles), this is not enough to spot a majority of roof issues. When performing an inspection on your shingle roof, get on top of your roof and look for curled, cracked, loose, or missing shingles. In addition to the roof, also look in your attic. Be sure to look for evidence of current or prior leaks. Roof leaks will often take the form of stains on your walls or wet areas in your attic. During the fall, leaves, twigs, and other debris tend to collect on your roof. When this occurs, this concentration of debris can gather moisture and begin to break down the shingles on your roof. On top of this, debris that collects in the valleys of your roof can impede the proper flow of water. Also, while we’re on the subject of debris, pay attention to any trees or limbs that are hanging over your roof or look like they could cause a problem down the line. If you notice them, having them removed or trim before the winter can potentially help avoid expensive roof repairs in the future. Keeping your gutters clean is an important part of roof maintenance. Clean and clear gutters allow for water and snowmelt to properly drain from your roof and into the downspouts. When this step is skipped, gutters can easily clog, causing ice buildup and dams. Additionally, when your drainage system is unable to channel water and snowmelt away from your home, this can cause damage to your garden beds and potentially pool around your home causing foundational issues. When cleaning gutters, ensure that your gutters are also tethered down, angled correctly, and free of leaks and holes. When temperatures are freezing and water is unable to flow through gutters, this can lead to a buildup of ice and snow in gutters and along roof ridges. When these ice dams form, water can pool behind it, increasing the likelihood of surface damage and water leaking into your home. Although there is no guaranteed way to eliminate ice dams, the chances of them forming can be drastically reduced by having a solid ventilation system in your attic. This means having a consistent flow of cool, dry air through your attic. If you have been putting off a roof repair and are considering waiting until spring to perform the repair, we would advise against it. Winter can be hard on your roof, and it can turn a small repair into a big costly repair — or worse, a total replacement. Remember that the integrity of your roof is critical to your home’s value. Keep these tips in mind this autumn and give your roof the maintenance it requires before winter arrives.